Jordan Brand is looking to give their women’s kick supporters a treat soon with the release of an eye-catching edition of the Air Jordan 5 GS. 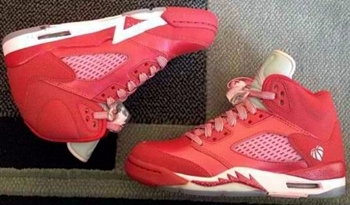 Recently, images of the Air Jordan 5 GS “Strawberry” has surfaced and has started to get a lot of positive remarks. The kick features pinkish-red suede on the upper part with touches of white on the tongue and the midsole of the kick plus a “For the Love of the Game” logo on the heel! We will keep you updated with this kick so make sure to stay tuned!